what is the little red blue dots on the image? pixels? Harb wrote that, not I! Looks like noise of some kind. Somebody should manually remove those. The image is beautiful! Why can we see the Milky Way on that photograph, but not on most other ISS photos? Because it takes an exposure of several seconds, so ISS must be deep within Earth's shadow to avoid any glare from an illuminated ISS. Also, ISS shouldn't be too lit by the Moon either. I can't see the image you guys are talking about. 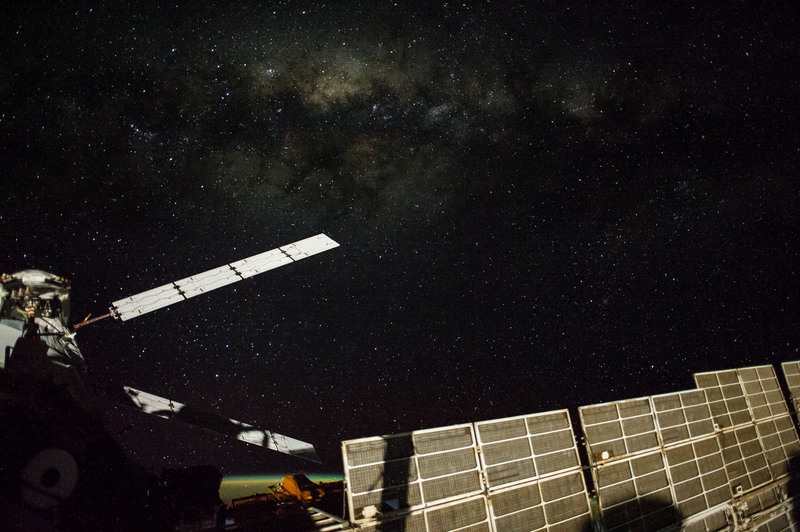 ISS must be deep within Earth's shadow to avoid any glare from an illuminated ISS. It's also because that picture was looking towards the center of the galaxy, the brightest part of the Milky Way, making it much more obvious than it usually would be. But I have seen many shots from ISS where MW is visible. Turned out my Chrome had some problems with DNS and was unable to load nasa.gov Fixed it now, wonderful picture. It's high saturation red/blue noise and so is easy to remove with LAB channel despeckling. Didn't get it entirely, but one pass makes a nice improvement. Yes, much better. Thank you. Is it an northern hemisphere impairment that I feel that the Milky Way is upside down in that picture? Trully awesome!! It's a large scale phonomena, how we couldn't detect it with our orbiters?